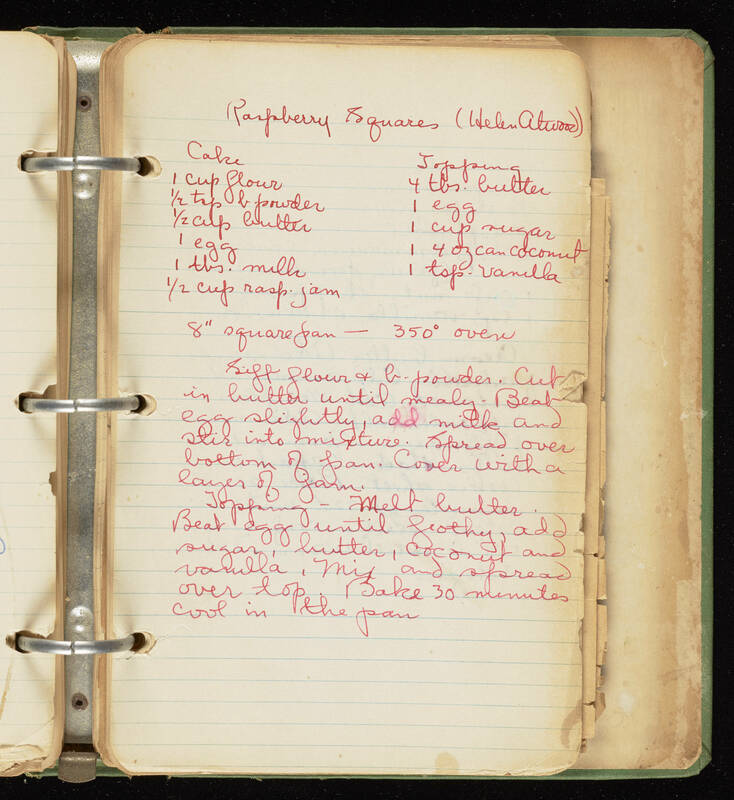 Transcribed by Mallory Sallmann Raspberry Squares (Helen Atcoor) Cake: -1 cup flour -1/2 tsp baking powder -1/2 cup butter -1 egg -1 tablespoon milk -1/2 cup raspberry jam Topping: -4 tablespoons butter -1 egg -1 cup sugar -1 4 oz can coconut -1 teaspoon vanilla 8"square pan-350 degree oven Sift flour and baking powder. [ ] in butter until ready. Beat egg slightly, add milk and stir into mixture. Spread over bottom of pan. Cover with a layer of jam. Topping: melt butter. Beat egg until frothy, add sugar, butter, coconut, and vanilla. Mix and spread over top. Bake 30 minutes. Cool in the pan.